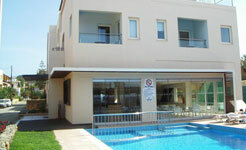 Despina Apartments: Platanias, Chania, Crete - Greece. 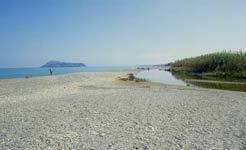 Despina Apartments is situated by the water-front of Platanias and only 12km from Chania. The hotel is located in the middle of the village of Platanias; very close to supermarkets, banks, restaurants and the friendly, family atmosphere makes it ideal for relaxing holidays. Our hotel consists of 22 air conditioned, large apartments with sea view. Safe deposit boxes are available at the reception desk. The outdoor space includes swimming pool, children pool, snack bar and restaurant - all this right in front of the famous Platanias beach awarded the Blue Flag (by the EEC). Despina Apartments consists of 22 large apartments with light marble floors, wooden furniture, a fully equipped kitchen (with oven, refrigerator and necessary utensils) WC, telephone, radio, air conditioning and balconies with sea or garden view. Studios for maximum 3 persons. 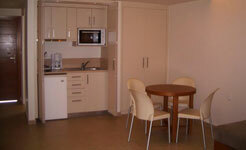 Apartments with one bedrooms (2 rooms) for maximum 4 or 5 persons. Apartments with two bedrooms (3 rooms) for maximum 6 persons. 30% discount from the 15th to the 30th of September. 35% discount from the 1st to the 31st of October. Platanias only a few years ago was mainly an agricultural area. 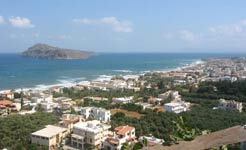 Today Platanias is a cosmopolitan touristic resort, one of the most famous in Grete. Platanias is 12 Km from Chania on the way to Kasteli. The 4 kilometers of the white shining sandy beaches, have given to platanias beach for 7 years in the row the blue flag ,a hallmark of quality of EEC for clear and organized beachs.The area offers all swimming facilities . The pleasure hotels the evergreens, the orange groves and exotic bamboo along the riverbanks , draw visitors year after year. This is a really blessed place. Visitors have the feeling of 4000 year of history and at the same time breathe the air of modern and cosmopolitan life. After a lazy day in the beach you can walk in the full of flowers little streets of the upper Platanias, a lot of restaurants with fantastic view waiting for you with delicious Gretan cuisine. Platanias is a fully organized small society with medical center, drugstores, police station, high school, banks, gas station, hotels, restaurants, cafes and bars, clubs, discos, jewelleries and many others touristic or not enterprises which make Platanias a significant touristic center of Crete. We are waiting for you to offer you our warm hospitality.